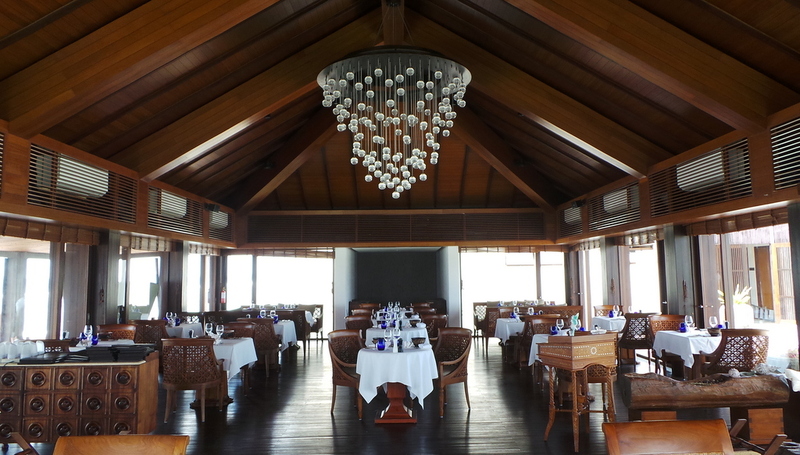 In the fiercely competitive realm of resorts in the Maldives, it is not unusual to see resorts with distinct ‘themes’ that define them from the rest. 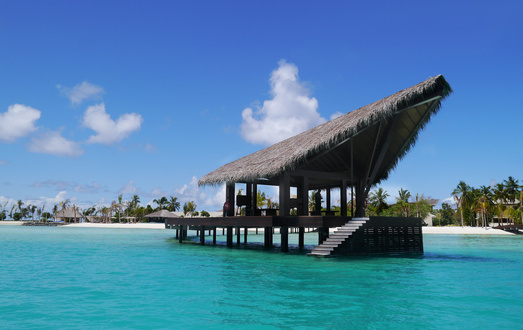 While it is exciting to see the different personalities and atmosphere that each resort offers, it is also refreshing to encounter one that quite comfortable in its own skin of time-honoured, no-fail elements of what makes a luxury resort in the Maldives. 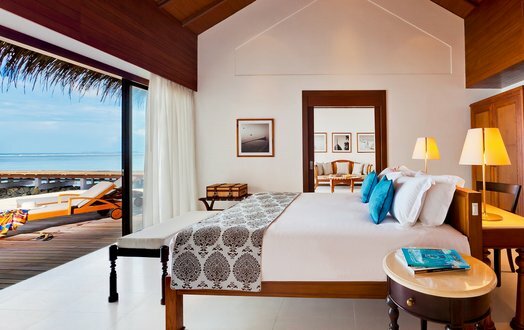 The Residence Maldives is located in Falhumaafushi, an island in the Gaafu Alifu Atoll, which is the northern part of the giant Huvadhoo Atoll, one of the largest atolls in the world. From Male, you will need to take a domestic flight to Kooddoo Island. I find it amusing that in all 6 seaplane transfers and 4 domestic flights we took in the Maldives, I’ve always been referred to as “Mr” in boarding passes. It happens quite frequently, not just in the Maldives. And though I’m quite used to it, I still find it very amusing. As soon as we landed and entered the Airport arrivals area from the runway, we were immediately greeted by a gentleman who is a staff from The Residence. He also waited for and took our bags from the conveyor belt. 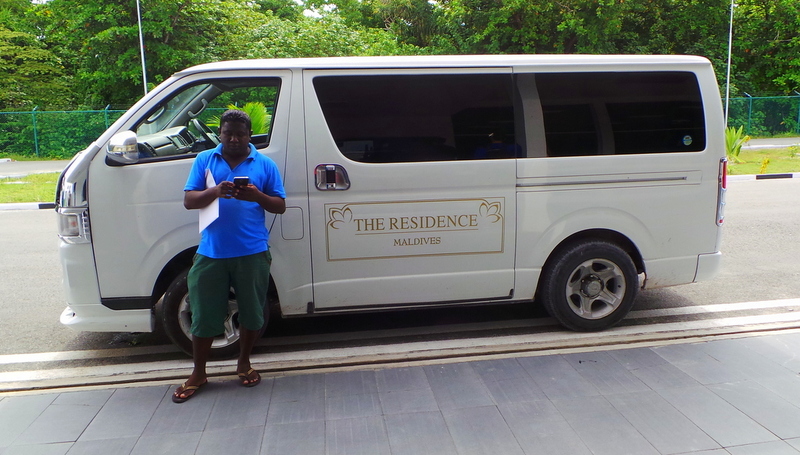 Outside the arrivals area, The Residence Maldives van was promptly waiting and ready. Soon our bags were loaded on to the van, and we were ready to leave. Except that the van kept sputtering on every attempt to start. And then it finally made up its mind and completely died. So we all trooped and marched to the dock, about a 15 minute walk from the airport. And it wasn’t so bad anyway because the sun was already starting to set. As we were walking, another hotel company’s buggy sped past us carrying their guests, waving merrily to us. “Well , well… we are burning calories and you’re Not!”, I muttered through my sneer as I waved back. 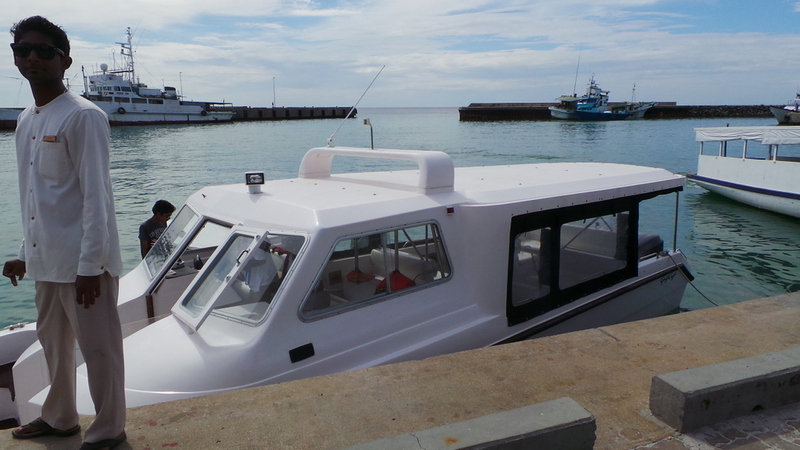 We reached the dock soon and enjoyed the breeze during the speedboat ride to the resort. Check-in was done ‘the traditional way’ via an open lobby with a welcome drink, and we ran through the course of our itinerary for our stay. Introductions were made and we took off with our villa host to go to the room. The living room, which is the first area when you enter, then the bedroom, which lies in the middle, and you get the bathroom on the right most. 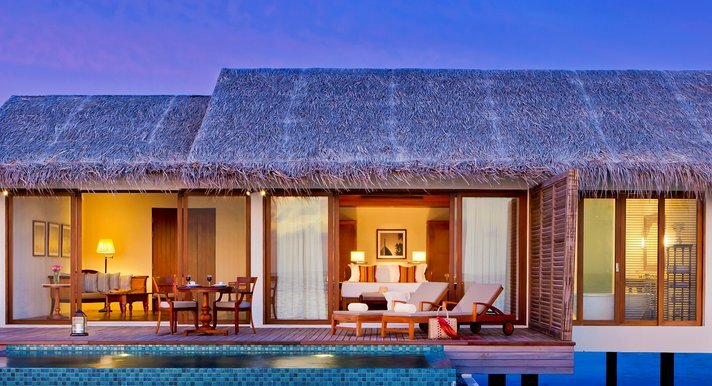 All villas (be it beach, deluxe or deluxe water villa, with or without pool), are laid out in the same systematic method. The outdoor deck is generously sized. The waters were too shallow for a bed to water jump unfortunately. The stand alone bath tub is my favourite feature of the bathroom. 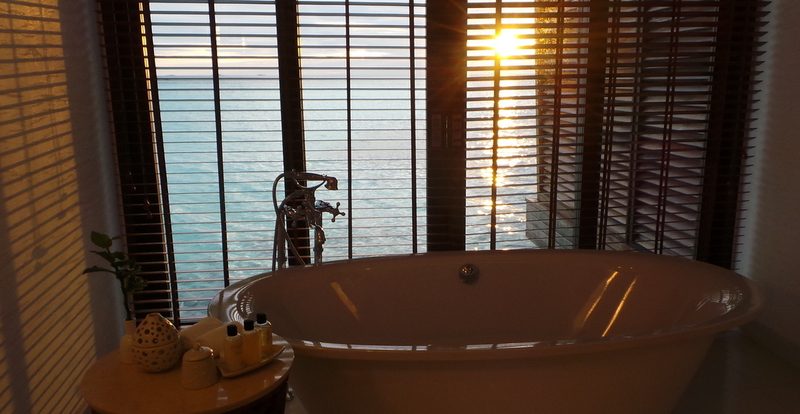 It faces the water, and as our water villa is west-facing, the view of the sunset was really spectacular while being in the tub. There were 2 types of showers in the bathroom. 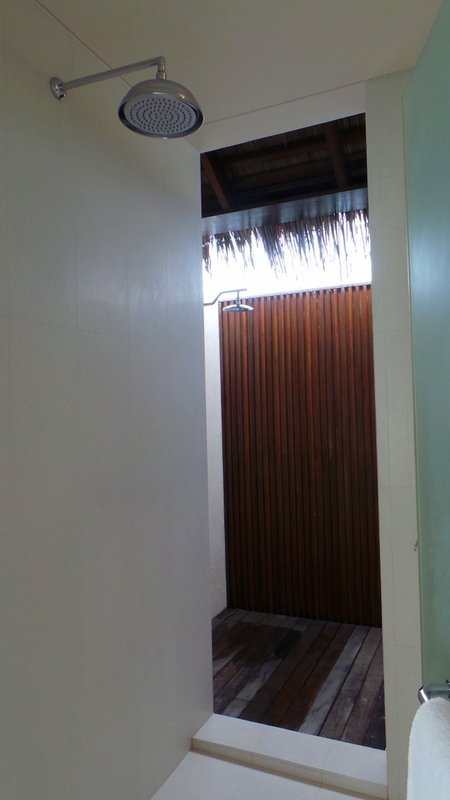 An outdoor one and a semi-outdoor one (well it does have a roof but right next to it is the outdoor shower so it is abit open). The outdoor shower does not have hot water, so this is something to keep in mind. 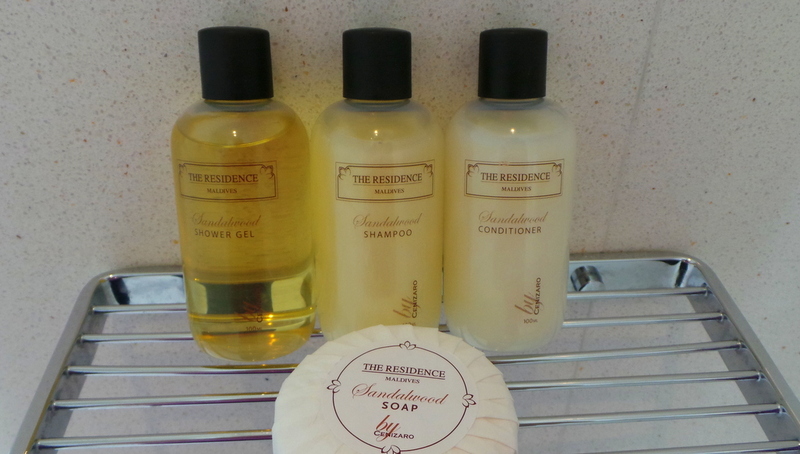 Toiletries are standard resort-brand. If you’re not very picky this is fine. I always bring my own set of paraphernalia anyhow and used my own for this stay. 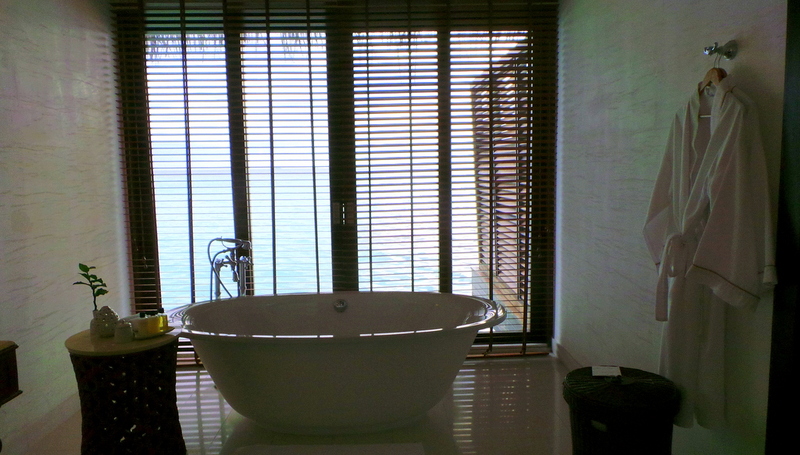 Here’s a video room tour of the one-bedroom villa at The Residence Maldives. 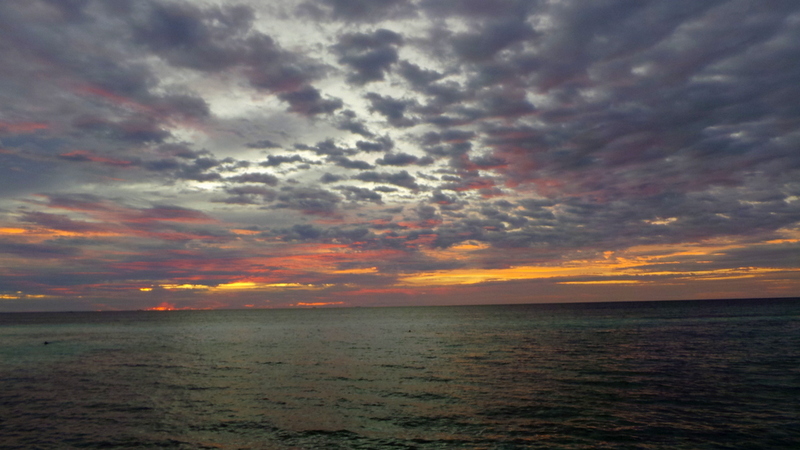 It is worth mentioning that all sunsets at The Residence Maldives were spectacular. 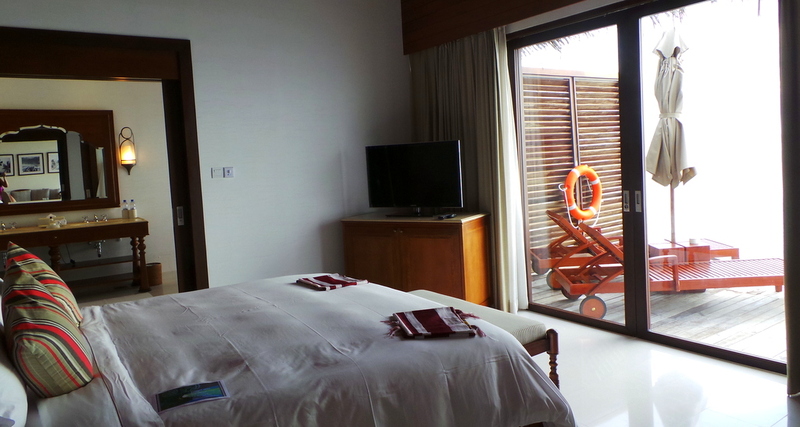 As I mentioned, our water villa was west-facing, so we had one of the most stunning sunset views, be it inside the bathroom, viewing from the bed, or just from the outdoor deck. Would you like a sunset with your bath, madam? 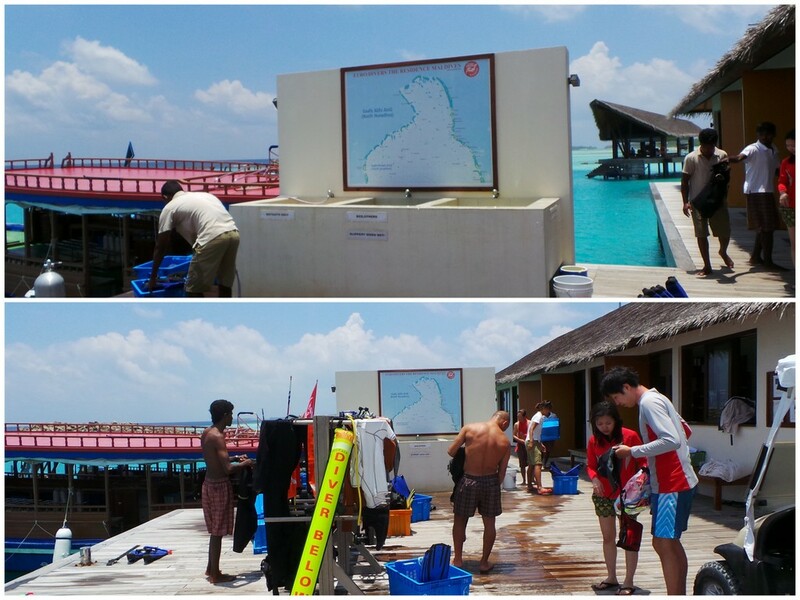 I’m so happy with the location of our water villa. I normally miss out on wonderful sunrise as I’m so not a morning person (double digit wake up time por favor!) and rely on Zombie’s description of it, or his time lapse footage of sunrise. This time, I feel glad I did not miss out on one of nature’s best sideshows! Now this is a lesson for all to literally dive beyond the surface. If you rise early in the morning, the waters are pristine and look really inviting. However, as as the day progresses, there are brown seaweeds that float close to the water villas. This of course, makes you hesitate to jump in blissfully in the waters. Zombie was determined to find treasures beneath those waters, so he did jump. And he did swim much further away from the villa before finding that one shouldn’t judge waters by its murky exteriors! 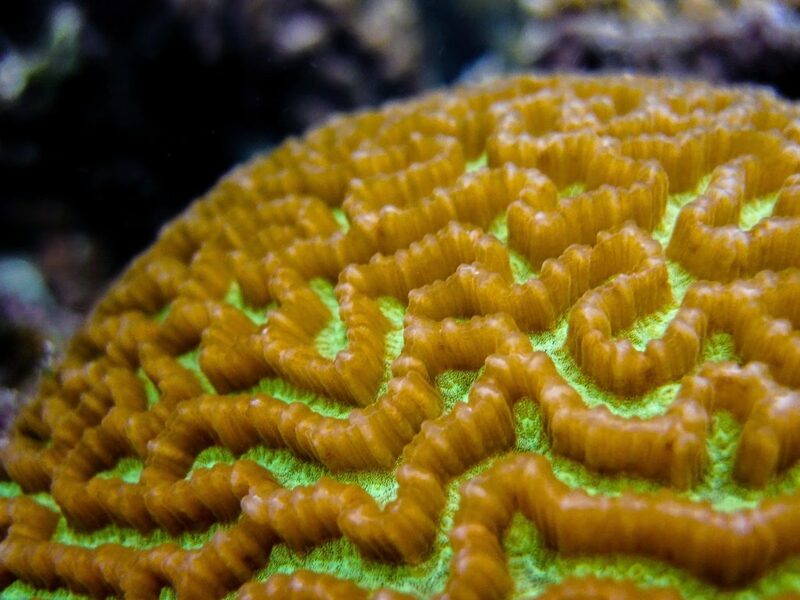 These are just some of what he saw underwater. 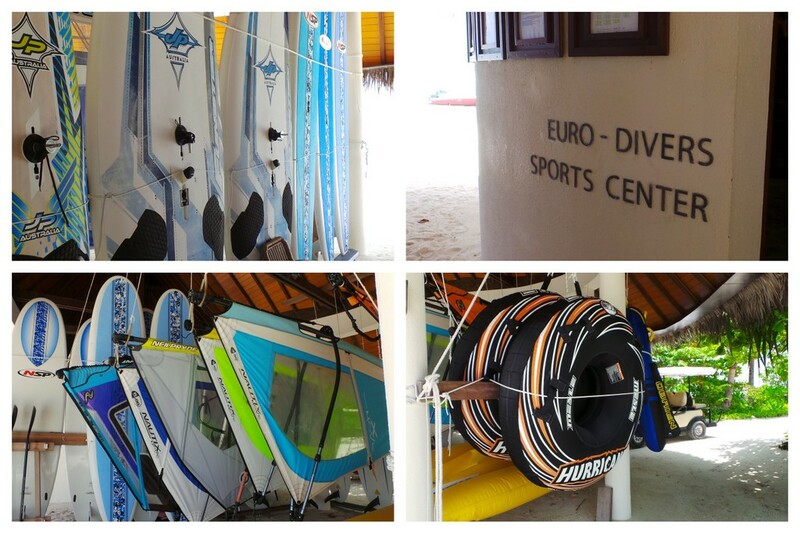 The Residence Maldives has a fully equipped Water Sports Centre. They have a diverse range of water activities – windsurfing, surfing, body boarding, snorkel, scuba , night fishing — and in all these, most of their equipment are well maintained. Though we did not dive with The Residence Maldives, we visited their Dive Centre twice and on both occasions, the centre was really, really busy. Batches of groups returning, a new group departing, dive masters and staff were busy running in and out of offices getting things organised. If you go on their scuba trips, showing your diving certificate won’t suffice. They will need to assess your diving skills by going on a “test-dive” first before the actual trip. And if you rent snorkel gear – they will also need to see your skills in the water. Ok, to some this may sound extreme. But I understand the resort’s point of view. There are a lot of tourists who do not know how to swim, and a lot are swept away by the romance of the holiday / honeymoon that they think love can keep them afloat. 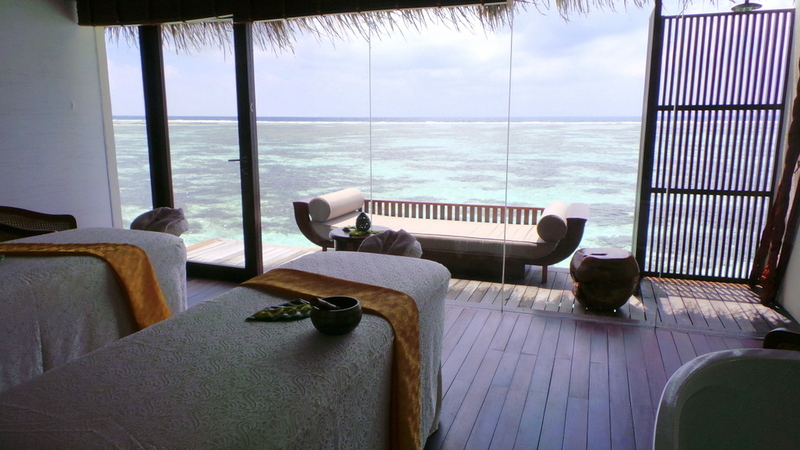 I learned that The Spa by Clarins is probably the most coveted activity at The Residence Maldives. 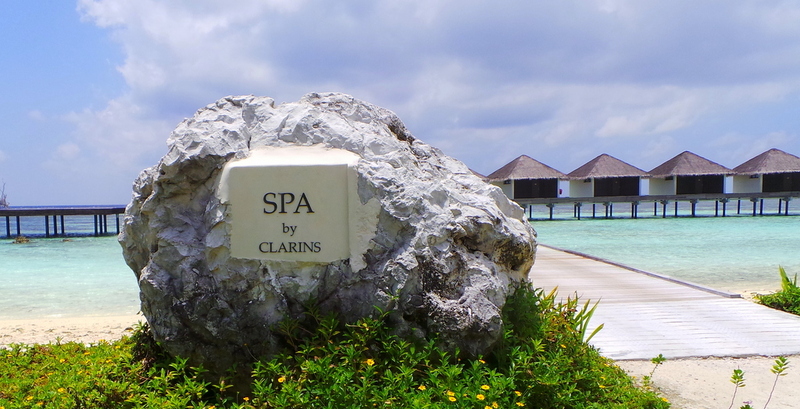 This is Clarins’ first Spa in the Maldives, and most guests make their bookings long before they even set foot in the resort itself. Little wonder why, just the location of the spa is enough to make you relax actually. 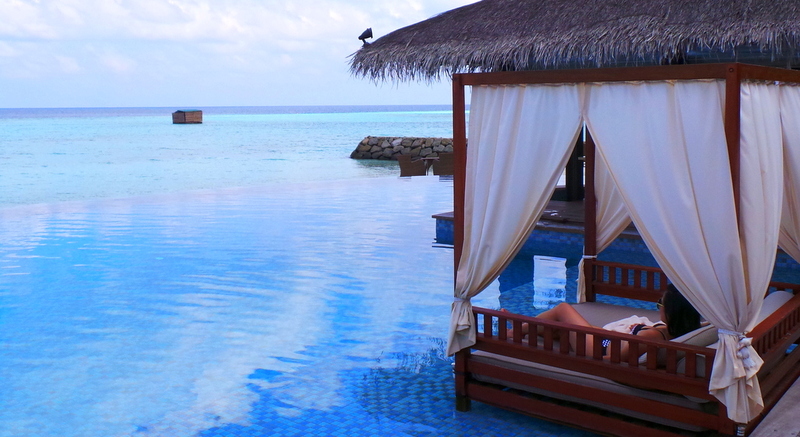 The infinity pool at The Residence Maldives is definitely one of the most photogenic locations of the resort. 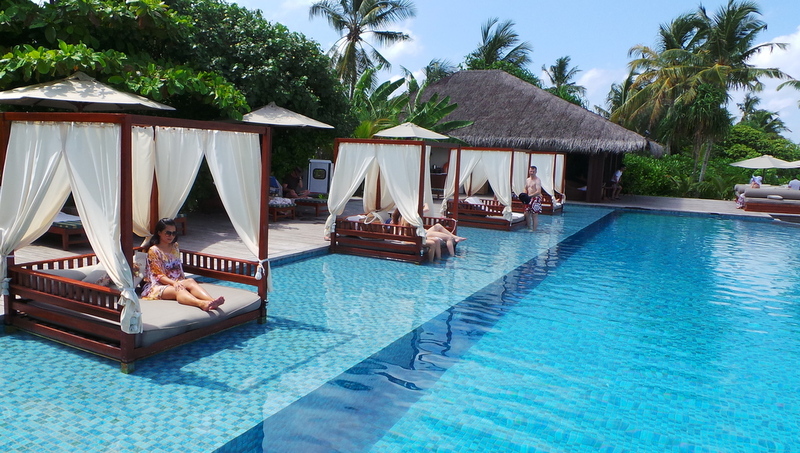 There are a number of lounge/semi-cabanas in the pool and it’s so easy and blissful to spend a long afternoon there just lazing, reading, or even sleeping. 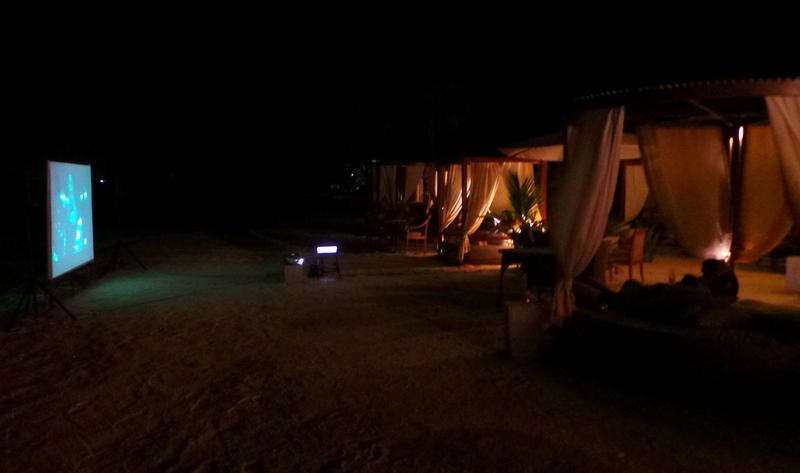 These special lounge/cabanas also extend to the beach and once a week, they hold a movie night. They were showing Thor that night, and it was a ‘full house’. The beach bar was also just nearby so you can have endless drinks and snacks while watching. 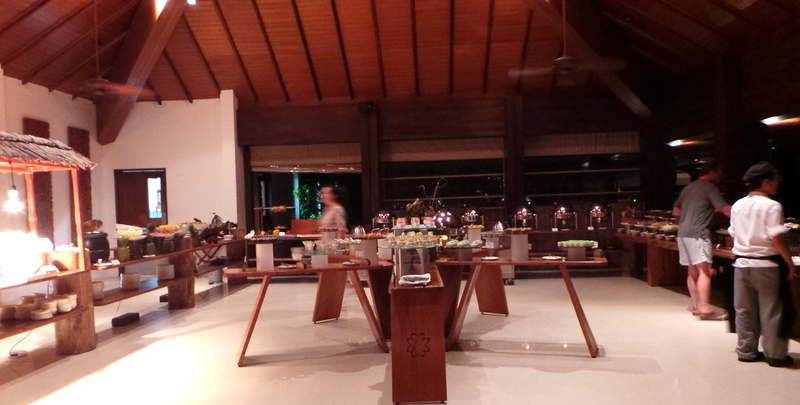 The Dining Room offers an international variety of buffet and ala carte dishes for breakfast, lunch and dinner. We’ve also been very impressed with how flexible they are. One of the chefs, who is from Indonesia, got into a chat with Zombie and casually asked him if he is craving for anything in particular. Anything at al, and he will create, he said. Zombie hesitated but said Mee Goreng. 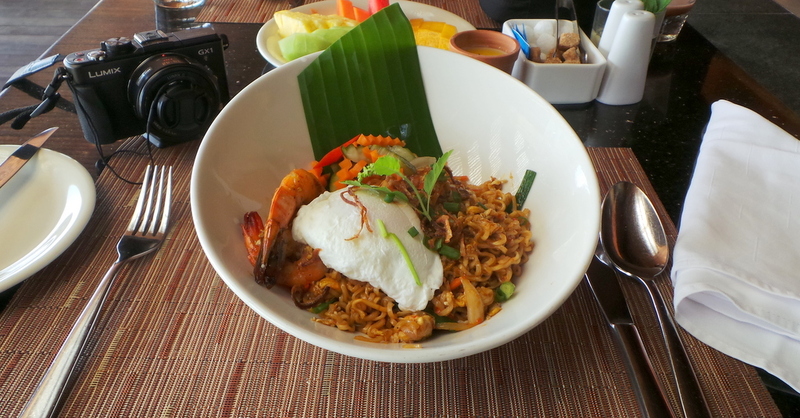 (Spicy Fried Noodles) The very next day, while we were having breakfast, a plate of freshly made Mee Goreng was presented to Zombie. Very impressive flexibility and demonstration of how much they cater to the resort guests. 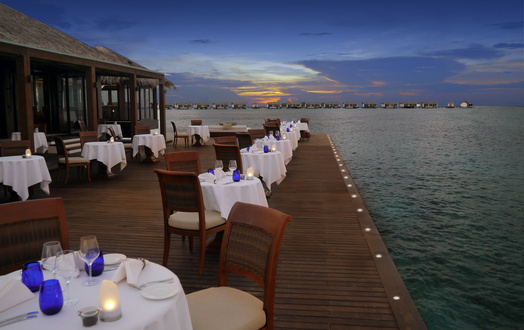 The Falhumaa is The Residence Maldives’ formal dining option. This over water venue is located at the end of a 230m long jetty above the reef and is open only for dinners (7:30 PM- 10:30PM, reservations are required). 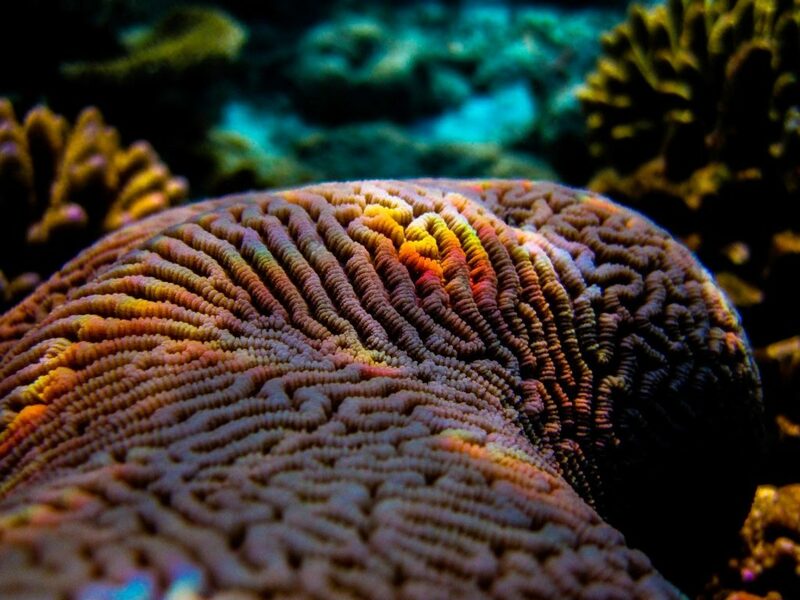 While the place is quite breathtaking by day, it is even more stunning at night , especially as the bright lights attract turtles and reef sharks to the edge of the restaurant. I’m happy to say that Falhumaa featured a lot of seafood on their menu with a mixed variety of Maldivian and Western style. 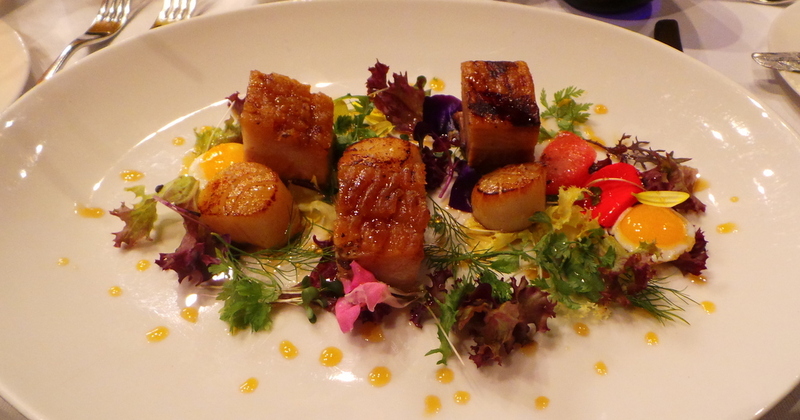 We began the dinner by washing our hands with rose water , and enjoyed our dinner tremendously. Here’s a couple favourites we had that night. We had a 3 course dinner and enjoyed every bit of the evening. 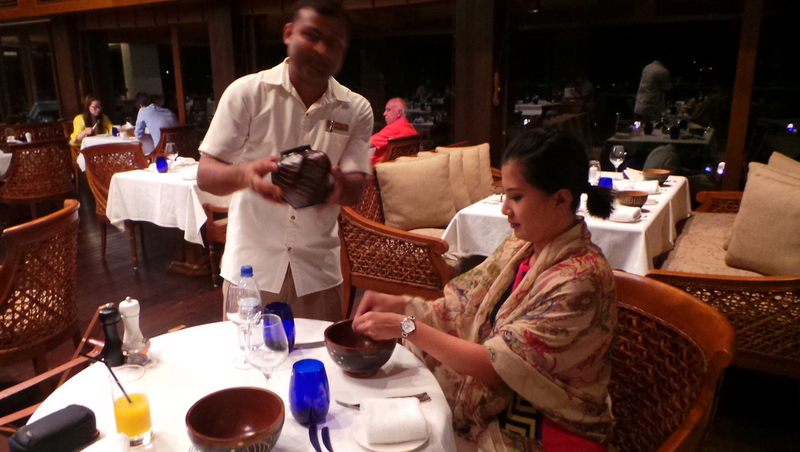 We had a dedicated staff at The Dining Room to see to our dining needs every time we went there to have our meals. Hafiz definitely was brimming with enthusiasm and did not lack in engaging us with small talk about our visit to The Residence. On the morning of our checkout, we were having breakfast quite hurriedly and Hafiz seemed to pick up our time constraint as he voluntarily brought a platter of fruit for us (normally this would be self-served from the buffet), saying he’s worried we may not have eaten enough. It was just a short interaction we had with Hafiz but very, very memorable for us. 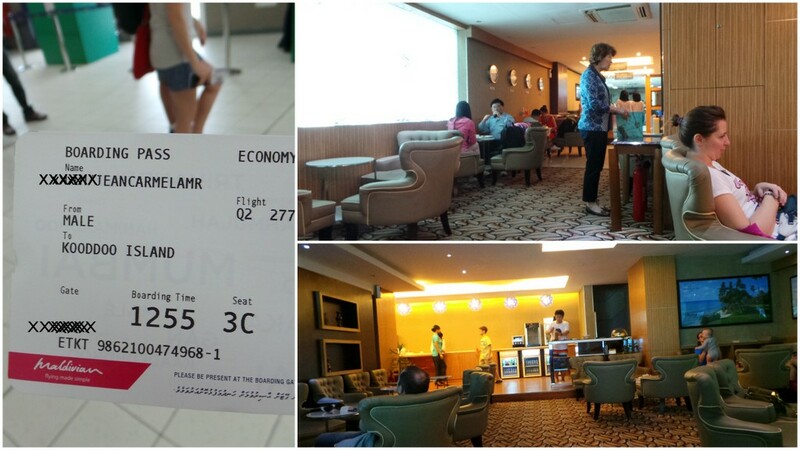 On checking out, we were accompanied by the same Residence staff who picked us up from the airport on arrival. He also dropped us off on our departure, doing the check-in himself at the airport. 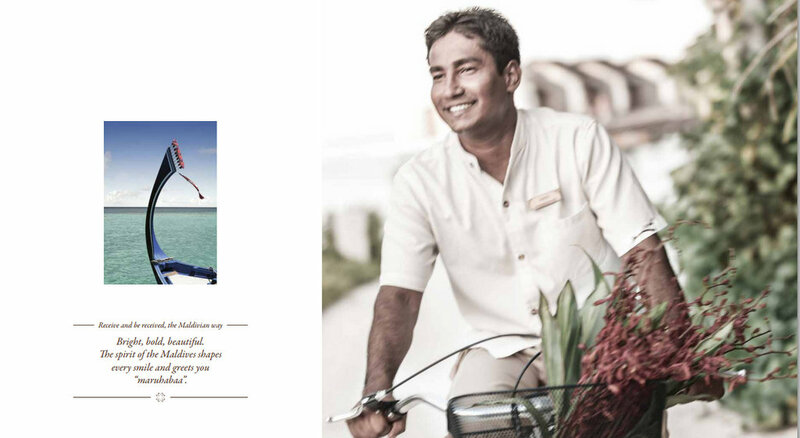 The Residence Maldives is a member of the Leading Hotels of the World, and is owned by Cenizaro Resorts & Hotel. Majority of the guests we saw are couples, and I would recommend this to couples who are quite laid back luxurious travellers. The uniformity of the room lay out ( the 3-part division) may discourage guests from making their stay varied , as some guests like staying in 2 different resort room types at the same resort. This breaks the holiday from being monotonous and offers them a new experience. With the uniform room design, some may argue that once you’ve seen one room, you have seen them all. 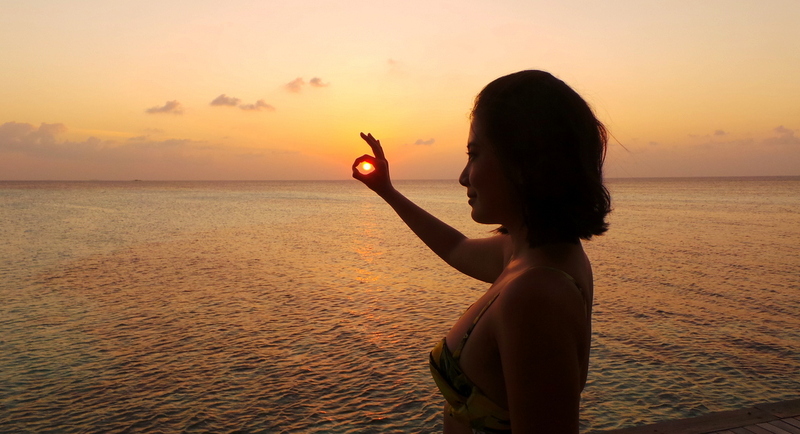 The strong points of The Residence Maldives are : the World-famous Spa by Clarins, food, brand new sports equipment and gym, stunning sunsets, lovely pool and enthusiastic staff. 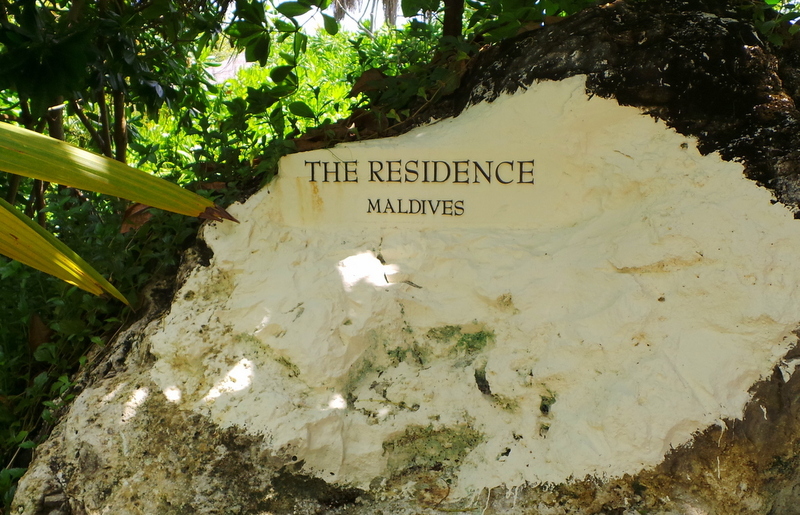 We were guests of The Residence Maldives and they have also covered both our airfares to Kooddoo Island. There is no obligation to write favourably, all opinions of this post are mine. 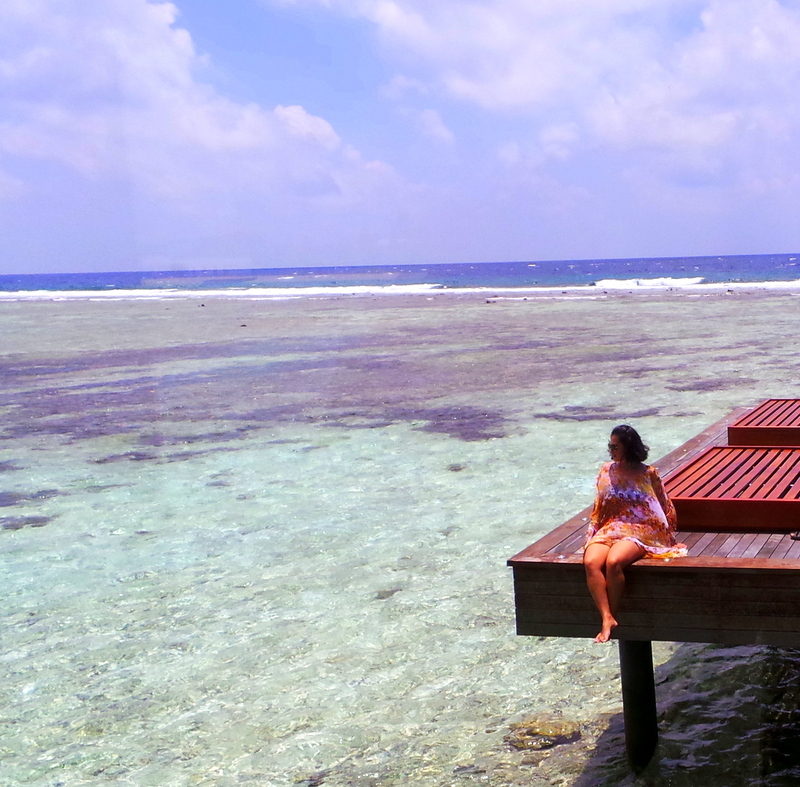 Hope to go to the Maldives sooon – maybe next year! 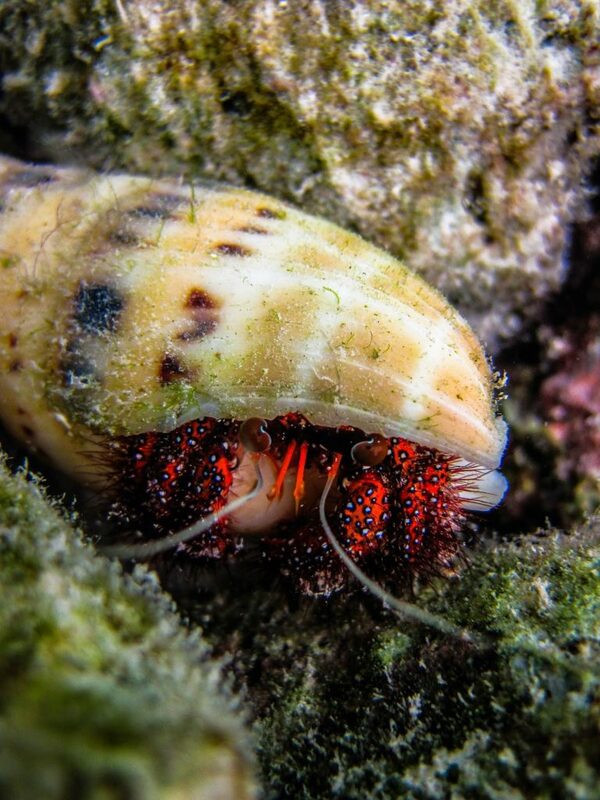 Lovely review and wow, what amazing underwater photos! What camera did you use for those? 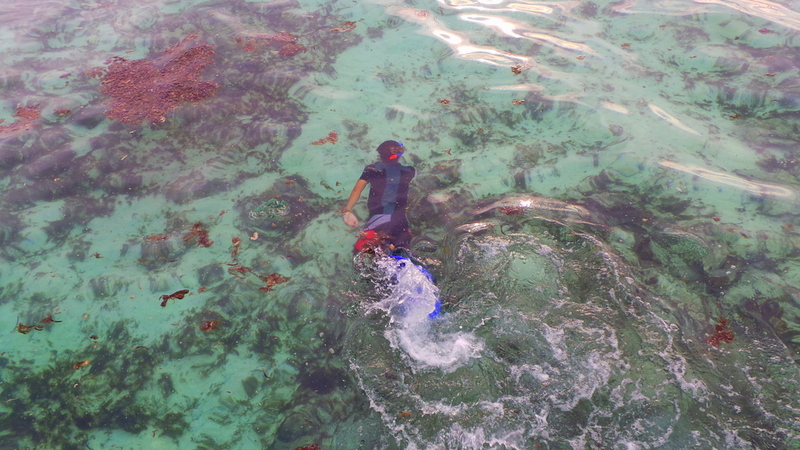 I liked the Maafushivaru experience better, the snorkelling on their private island was also wonderful!